Its that special time of the year, where Eid is just around the corner. And that means stocking up on gifts for family and friends. How about going for a different kind of gift, than the usual stuff. Delicious chocolate covered popcorn Bonbons makes a perfect gift for this special occasion. Chicago’s popcorn experts- Garrett has recently opened a premium, high-end popcorn concept in Lower Ground Floor, Star Atrium in The Dubai Mall. This concept is aptly named Garrett Gold. Garrett Gold offers a unique variety of their signature bakes using popcorn. You can expect the best of every sensation with sweet, salty, tender, creamy and crispy flavors in every bite. The Garrett Gold concept store serves up original Garrett flavors like Caramel Crisp and Cheese Corn along with Karak and other exotic flavors. They not only offer popcorn with unique flavors, Garrett Gold also offers popcorn pretzels, brownies topped with popcorn, popcorn bars and chocolate covered Bonbons. Not to be missed are the Garrett Gold Beverages by Raw Coffee, a well known homegrown specialty coffee brand. 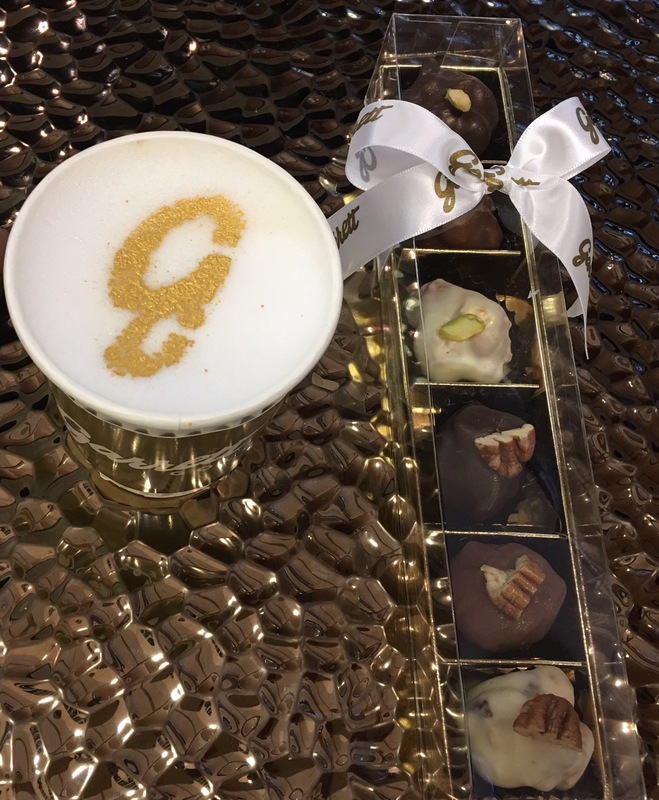 I loved my flat white coffee adorned with a gold signature G.
The chocolate covered popcorn Bonbons in different flavors that were garnished with gold dust were fantastic. They come in vibrant gift box sets and trays in beautiful patterns specially for Eid Al Adha. I relished their sweet and savory popcorn, smooth chocolate covered bonbons and coffee. Can’t wait to visit them again. Popcorn fan or not, this place is worth visiting. And their Eid gift box sets are awesome.